On-Costs can be enabled if your employees have a specific on-going addition to their employment cost. For example, if you’re required to pay 9% to their superannuation cost a week, you can enter in this 9% and it will be added to the weekly cost figures in the scheduling page. First, you’ll need to navigate your way to the Locations tab. Now click on ‘Edit Settings’, corresponding with the location that you want to add On-Costs to. Now navigate to the ‘Scheduling’ tab. Scroll down to ‘Apply and Report On-Costs’ and enter in the percentage value that will need to be added to the additional costs. Remember to click ‘Save’ at the top to confirm the changes. 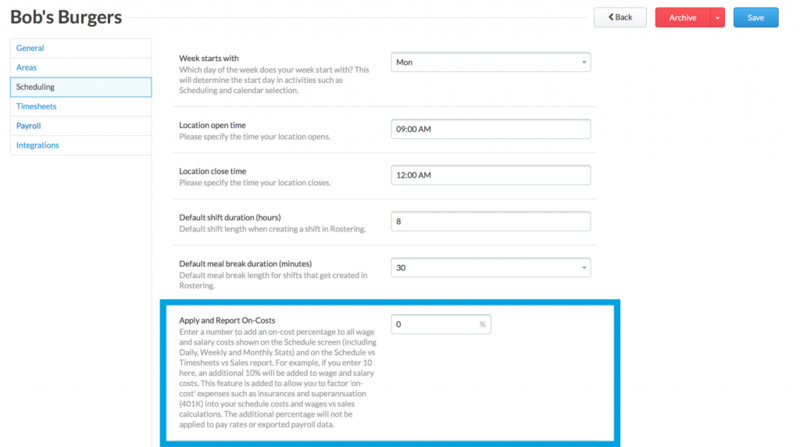 When you create new schedules in the Schedule tab, the On-Cost figures will automatically be added to the Estimated Cost.